In the midst of an economic downturn, officials had drastically slashed the museum’s funding, reducing the budget to just 10 percent of what it was in 2013. A private association resorted to crowdfunding maintenance projects, including the restoration of a termite-infested dinosaur display. Meanwhile, fire-retardant systems and nearby hydrants lay neglected. And yet, over the same period, the Brazilian government spent billions in preparation for the 2014 World Cup and the 2016 Rio Olympics. The delays, pollution, and corruption that plagued the country’s preparation for the events were widely publicized. 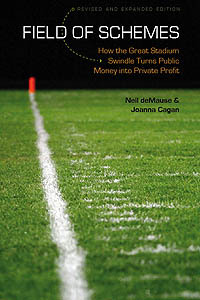 Six of the 12 stadiums constructed for the World Cup later faced investigation for financial irregularities and bribery. No, there’s no direct connection between the billions of dollars Brazil spent on the 2014 World Cup and 2016 Rio Olympics and the fire that destroyed the country’s National Museum, leaving only photographs as a reminder of what was lost. (And this wasn’t the first Brazilian museum to burn down in recent years.) People can (and I’m sure will) argue that if Brazil hadn’t wasted its money on sports, it would have wasted it on something else other than sprinkler systems. The most expensive World Cup stadium — located in the capital, Brasilia, and with a price tag of $550 million — is being used as a parking lot for buses. The stadium in Cuiaba — which cost some $215 million to build — has made news repeatedly: first for being closed down because of faulty construction, and then recently for the homeless people squatting in its unused locker rooms. The stadium in Natal is trying to make money by hosting weddings and kids’ parties — with little luck. Brazil spent about $15 billion on the World Cup overall, and the government has long since given up pretending that it was worth it. (Especially when the defining moment of the tournament itself was Brazil’s team getting embarrassed by Germany.) The 2016 Summer Olympics in Rio, though, those are surely going to be awesome, because nothing ever goes wrong for countries that host the Olympics. An initial estimate for Brazil shows a projected SUI [stadium use index, or pro-rated number of capacity crowds per year] that would be among the lowest of recent hosts, with stadiums in Brasília, Manaus, and Cuiabá among the least-used stadiums from any recent World Cup. This poor stadium usage, combined with the highest nominal stadium construction costs of any World Cup, leads to a projected record-high FCI [fan cost index] of over $1,000 of stadium construction costs per fan in attendance in four years. But really, who can put a price on providing your richest, whitest citizens the ability to go watch international soccer? The silver lining, Matheson notes, such as it is, is that Russia is already looking to spend $7 billion on stadiums for the 2018 World Cup, a number that will surely rise. And the 2022 Cup is currently scheduled for Qatar, where money (and human life) is no object. So Brazil could end up only holding the record for most money thrown down a hole for four years, or at least eight. Order those “Brazil Stadium Spending World Champions” commemorative t-shirts while you can! There’s a separate staircase a short distance away, but it’s for VIPs so most fans can’t use it. That’s about as good a metaphor for Brazil’s World Cup stadium spree as any. Unless it’s the $300 million, 42,000-seat stadium they built in a city with no pro soccer team and where one-quarter of the population has no running water. That’s pretty good too. Imagine you live in a city on the cusp of becoming a major regional hub. (Put your hand down, Cleveland.) Your country’s economy as a whole is humming along, local industries are propelling an influx of domestic and international migrants, and your hometown has just been selected as a host city for the World Cup. Then you get promised new hospitals! And a light rail system! And boy, things are really looking up for you, aren’t they? About 400 people demonstrated outside the stadium during yesterday’s match, some burning FIFA flags, others American flags. I guess because the U.S. invented spending way too much on sports stadiums? Though then really somebody should have burned a maple leaf, for historical accuracy. Meanwhile, Brazil’s stadium built in isolated Manaus in the middle of the Amazon rainforest is a sandy mess two days before it’s set to open with Italy vs. England, widespread protests continue against the estimated $14 billion the government is spending on hosting the World Cup, and John Oliver’s video on how horrifically corrupt FIFA is has three million hits on YouTube. I can’t wait to see how the World Cup announcers deal with all this on today’s broadcast — my guess is they’ll mumble something really fast and hope that it’s drowned out by caxirolas. The Japan Sports Council announced that it was trimming the budget of its planned $3 billion stadium for the 2020 Summer Olympics by almost half, but a prominent local architect still decried the plans as “a sin” and “a crime” for being out of scale with its surroundings. After the UK’s Sunday Times revealed that former Qatari FIFA vice president Mohamed bin Hammam paid more than $5 million in bribes to have the 2022 World Cup awarded to his broiling-hot-in-the-summer-when-the-World-Cup-is-played nation, FIFA vice president Jim Boyce announced that he would support a re-vote on a new host for that year’s soccer tournament. It was announced that Itaquerao Stadium in São Paulo, which is supposed to host the 2014 World Cup opener in ten days, will only be able to open at 62% capacity for its final warm-up match, with the fire department having refused to issue a safety permit for one entire seating area. No, it doesn’t mean that the World Cup and Olympics are now defunct, and will be replaced by one of those sporting events that involves everyone batting a giant ball into the air. But suddenly lots and lots of people are saying aloud that these mega-events tend toward being terrible catastrophes for the locales tabbed to host them, which isn’t a new concept, but isn’t usually discussed quite so widely. Though, of course, a few months ago people were actually interested in Russian human rights abuses against lesbians and gays, until they actually started playing sports and there was curling to watch, so maybe this is just the usual “the games haven’t started, we’re bored and have nothing to report on” run-up that will be completely forgotten later on. The opening game of the 2014 World Cup is five weeks from yesterday, and … seriously? Again? A worker at a World Cup stadium in Brazil died Thursday in an electrical accident, temporarily interrupting construction at one of the most-delayed venues only five weeks before the soccer tournament. Rosenil Moraes, head of emergency services in the western state of Mato Grosso, said the construction worker received an electric shock at the site of Arena Pantanal in the wetlands city of Cuiaba. He died more than half an hour later of a cardiorespiratory arrest. Officials were not clear on what caused the accident. That makes eight deaths so far of workers on World Cup venues, which actually could be a lot worse, considering the projections that 4,000 workers will die building facilities for Qatar’s 2022 World Cup. Not that eight deaths is a good thing. The Brazilian government insists that all World Cup stadiums will open on schedule, because what else are they going to say? “Hey, at least this time it didn’t catch fire“? Valcke also noted “potential issues” with two other stadiums in Curitiba and Porto Alegre, but insists that everything will be fine in time for the opening, because, well, it has to be? And there’s no way any more workers are going to fall to their deaths and delay construction, because that already just happened last month, and anyway, death always comes in sevens. It was the second death at the Arena Amazonia this year and the third at a World Cup venue in less than a month. A few hours after Saturday’s death, another worker died of a heart attack while paving an area outside the venue in Manaus. Two workers were killed when a crane collapsed on Nov. 27 as it was hoisting a 500-ton piece of roofing at the Sao Paulo stadium that will host the World Cup opener. Last year, a worker died at the construction site of the stadium in the nation’s capital, Brasilia. The first death at the Arena da Amazonia happened in March. Another worker died in April at the new Palmeiras stadium, which may be used for teams training in Sao Paulo. Construction deaths are sadly not all that uncommon, but the rush to complete six new stadiums for next summer’s World Cup (and accompanying protests) has highlighted some of the problems of building on a tight timetable. Already none of new venues will be ready by the end of the year as planned; they’re still all expected to open in time for the actual World Cup in June, but it’s starting to get a bit dicey, especially now that construction workers at the stadium in Curitiba, the stadium furthest behind schedule, have gone on strike over late pay. But hey, you can’t put a price on the free publicity from a World Cup, right?